Made to chill in the refrigerator, this teether is a cool choice, so long as proper care is used. Just don't try to freeze them. 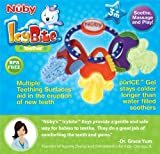 Often called a "go-to" teether by reviewers, the IcyBite Teether Keys have both hard and soft places with multiple textures to help new teeth erupt. After being placed in the fridge, the gel-filled portion of the keys become cool, helping to soothe sore gums. Though most of the reviews have been quite positive, we found that confusion over this toy's use and care has led to some frustration. Bouncing back from a 2009 voluntary recall, this toy still seems to please. Unlike older versions of the IcyBite, these are not meant for the freezer, dissapointing some users. Used only for baby toys, we grade toys on the types of sounds they make. Be it soothing lullabies, energizing dance music, or animal sounds, noises should not be dangerously loud. Used only for baby toys, this measures how much this toy will keep baby’s attention by drawing their eye. This score refers to this toy's ability to teach your child that every cause has an effect. Used only for baby toys, this measures how attractive a toy is to a baby, as well as how long they will likely pay attention to it. Used instead of Replay. Three teething keys on solid plastic key ring. Each key has a different texture, giving teething gums different sensations. The top of the key is hard plastic with rubber sides, while the lower part of the key is gel-filled. The company logo is stamped onto the red plastic piece at the top of the key-ring. Teething babies are able to chew on the various textures found on the keys. Raised bumps of different shapes and sizes helps to massage sore gums as well as assists in the eruption of new teeth. When cooled in the refrigerator, the gel-filled portion of the key can provide soothing relief to sore gums. Babies may also have fun using the toy as a rattle, as the plastic keys will make some noise when moved around. Much of the feedback on this toy was positive. Many children seem to take readily to the teether, and many users reported it being a toy the child reached for on their own. Several users reported that the keys are long enough to reach the back teeth area, making for a more satisfying teething experience. A few users said their child choked a bit on the key because of its length, but those reports were very small in number, and no actual injuries were reported. Supervision should be given to children using this toy. Not applicable. No additional parts are needed. The manufacturer reports that this toy is made from plastics that are free of BPA, PVC, Phthalates, and latex. Many instances of confusion over proper use and care of this toy have been noted. This has caused frustration, as unlike IcyBites of the past, this version cannot be frozen. Though clearly stated on the teether’s back packaging, we understand that users expect this toy to be used in the same way as its predecessor. We would like to note that the image on the Amazon website is of a previous packaging. The words “Refrigerator and freezer safe” no longer appear, and the directions of use clearly state that this toy is meant for the fridge only. Freezing the keys can lead to the gel-filled portions rupturing, leaking gel. 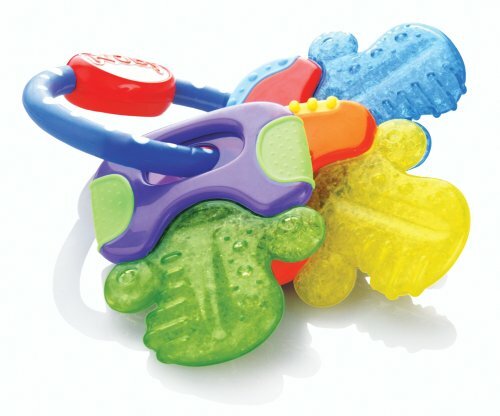 A few users reported teething babies being able to chew off small pieces of the hard plastic. This could potentially be a chozing hazard, so we recommend monitoring the use of this toy. There were no reports of children ingesting or choking on the plastic. In 2009, Luv ‘N Care voluntarily recalled all their gel-filled teethers due to a bacterial contamination in a small portion. According to the FDA, the gel was found to have Bacillus subtilis and Bacillus circulans. Normally not dangerous to healthy individuals, children with weakened immune systems could be susceptible to flu-like symptoms if either bacteria were ingested. We found no evidence of illness due to the toys. A link to the one of the FDA reports on the matter can be found at the below. The cool resilient surfaces soothe and stimulate sore gums safely and stays colder, longer than water filled teethers! While colorful shapes stimulate your baby visually, the raised, offset surfaces assist in the eruption of new teeth by gently massaging your infant’s gums. 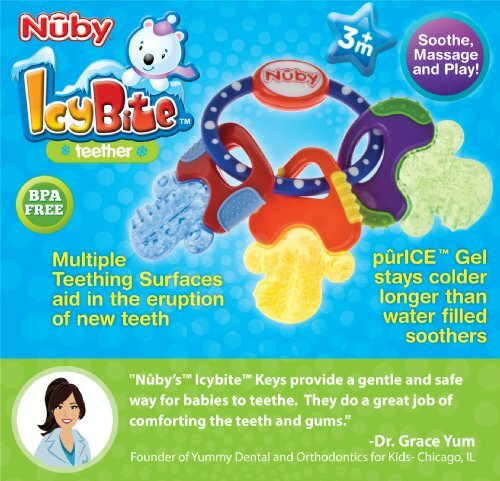 This Nûby™ teether also features areas filled with pûrICE™. This teether can be placed in the refrigerator and the pûrICE™ will remain colder longer than water filled teethers!